Those who were not fortunate enough - and, indeed, those who were - to witness Rudolf Nureyev’s genius in his lifetime should not miss the gala created in his memory by the Vienna State Ballet (Wiener Staatsballett). Manuel Legris produced the first Nureyev Gala in 2011 for the Vienna State Opera to celebrate the dancer’s artistry and impact on the worlds of both classical and contemporary ballet. 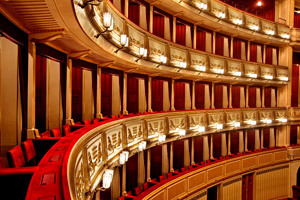 Now an annual event that caps the end of each season of performances by the Vienna State Ballet, 2019 marks the ninth Nureyev Gala at the Staatsoper Wien. It is unsurprising that Legris should pay his own, very personal, tribute to Nureyev in this way. Nureyev named Legris as star dancer with the Paris Opera Ballet when he took the role of Jean de Brienne in Nureyev’s New York production of Raymonda in 1986. An event that gives audiences the opportunity to relive some of the master’s greatest moments, the Nureyev Gala attracts bravura performances from members of the Vienna State Ballet as well as the participation of guest artists from a host of other companies. Nureyev has achieved an almost mythical status in our imaginations. From his legendary dancing partnership with Dame Margot Fonteyn through to his own outstanding choreographies as a ballet master, his influence has touched ballet like no other figure in the genre. Art is often valued for its capacity for reinvention, but it is telling that someone as accomplished in his own right as Legris is not prepared to make the slightest change to Nureyev’s choreographies. For Legris, who still recalls Nureyev’s words when he was his student, the challenge is to achieve the same level of discipline that was the hallmark of Nureyev’s work, ensuring that every detail of his productions chimes with Nureyev’s original conceptions. Nureyev once said, “As long as my ballets are danced, I will live.” Just as the wonderful New Year Concert, which joyfully remembers the music of the Strauss family, has become an annual fixture in the Viennese arts calendar since 1939, Legris hopes that these early years of the Nureyev Gala will see the beginning of a new tradition in the Austrian capital that is just as compelling for lovers of dance.